Painful menstrual periods, also called dysmenorrhea, may include pain in the pelvis, abdomen, back, or legs, abdominal cramps, headache, and fatigue. Most women have painful periods at some time in their lives. In some women, the pain is severe enough to interfere with normal activities. Primary dysmenorrhea is caused by high levels of prostaglandins in the uterus. Prostaglandins are hormone-like substances normally found throughout the body. 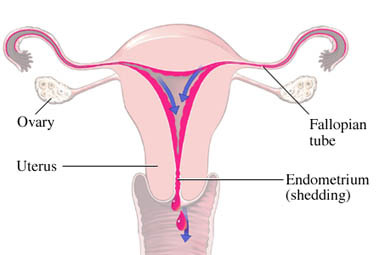 You are also at risk if you have a related condition, such as endometriosis or ovarian cysts. Also, call you doctor if you are having vaginal bleeding or pain and are unsure if it is related to menstruation. You will be asked about your symptoms and medical history. A pelvic exam will be done. Primary dysmenorrhea is usually treated with medications and lifestyle changes. The treatment of secondary dysmenorrhea varies depending on the underlying condition. Over-the-counter nonsteroidal anti-inflammatory drugs (NSAIDs) are usually the first-line treatment for menstrual pain. Examples of these medications include ibuprofen and naproxen. Birth control pills may be prescribed in some cases. Coco AS. Primary dysmenorrhea. Am Fam Physician. 1999;60:489-496. Dysmenorrhea. Cleveland Clinic website. Available at: http://my.clevelandclinic.org/disorders/dysmenorrhea/hic%5Fdysmenorrhea.aspx. Updated July 13, 2014. Accessed September 12, 2017. Dysmenorrhea. EBSCO DynaMed Plus website. Available at: http://www.dynamed.com/topics/dmp~AN~T116170/Dysmenorrhea. Updated February 23, 2017. Accessed September 12, 2017. Dysmenorrhea: symptoms. Family Doctor—American Academy of Family Physicians website. Available at: http://familydoctor.org/familydoctor/en/diseases-conditions/dysmenorrhea.html. Updated April 2014. Accessed September 12, 2017. French L. Dysmenorrhea. Am Fam Physician. 2005;71:285-291. Available at: http://www.aafp.org/afp/2005/0115/p285.html. Accessed September 12, 2017. Menstrual cycle problems. American Academy of Family Physicians website. Available at: http://familydoctor.org/familydoctor/en/health-tools/search-by-symptom/menstrual-cycle-problems.html. Accessed September 12, 2017. Pelvic inflammatory disease (PID): CDC fact sheet. Centers for Disease Control and Prevention website. Available at: http://www.cdc.gov/std/pid/stdfact-pid.htm. Updated July 10, 2017. Accessed September 12, 2017. 9/30/2008 DynaMed Plus Systematic Literature Surveillancehttp://www.dynamed.com/topics/dmp~AN~T116170/Dysmenorrhea: Witt CM, Reinhold T, et al. Acupuncture in patients with dysmenorrhea: a randomized study on clinical effectiveness and cost-effectiveness in usual care. Am J Obstet Gynecol. 2008;198:166.e1-8. 4/15/2014 DynaMed Plus Systematic Literature Surveillance http://www.dynamed.com/topics/dmp~AN~T116170/Dysmenorrhea: Osayande AS, Mehulic S. Diagnosis and initial management of dysmenorrhea. Am Fam Physician. 2014;89(5):341-346. 6/18/2014 DynaMed Plus Systematic Literature Surveillance http://www.dynamed.com/topics/dmp~AN~T116170/Dysmenorrhea: Kannan P, Claydon LS. Some physiotherapy treatments may relieve menstrual pain in women with primary dysmenorrhea: a systematic review. J Physiother. 2014;60(1):13-21.